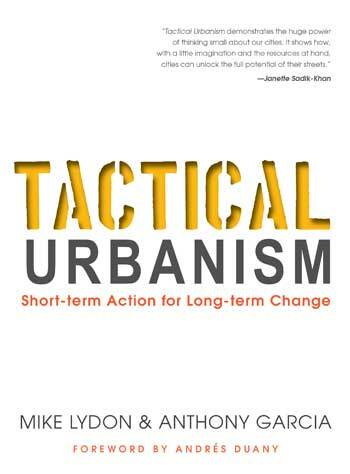 Tactical Urbanism: Short-term Action for Long-term Change, a new book by urban planners Mike Lydon and Anthony Garcia is the first book to really organize all the small fixes that seem to have spontaneously sprung up in so many communities in a way that everyone can understand. These fixes — some temporary and others long-term — aim to address common problems in communities today, often in streets and public spaces: a lack of safe sidewalks or crosswalks; the absence of clear signage; the dearth of neighborhood parks and plazas, and, more broadly, the lack of community connection and solidarity. 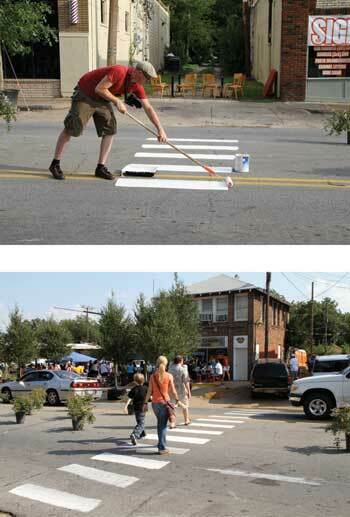 Shedding its perception as an illegal or “guerrilla” approach, tactical urbanism is becoming a method of choice for innovative local governments, developers, or non-profits as well. What one learns from the book is that it’s now an approach happening everywhere, not just in New York City, with its transformation of Times Square and other car-only places into pedestrian plazas, or San Francisco, with its Pavement to Parks program, which led to the explosive growth of parklets everywhere. These types of small, yet potent interventions are going mainstream because they work — at least at fixing some problems. Leaping forward thousands of years, Lydon and Garcia explain the woonerf, Dutch for “living yard,” which came out of a local citizen’s action in the Dutch city of Delft to slow down car traffic in a residential area. The residents tore up the street themselves in the middle of the night so cars would be forced to more carefully navigate their neighborhood. Their streets then became safe for bicycling, playing, and walking — not just a through-lane for cars. At first, the municipal government ignored the woonerf, but, seeing it succeed and spread as a model, they decided to advocate for it. 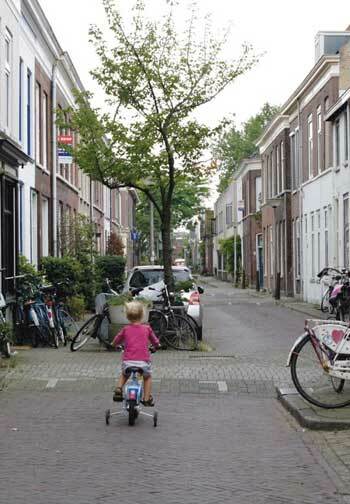 In 1976, the Dutch parliament passed regulations incorporating woonerven into the national streets code. 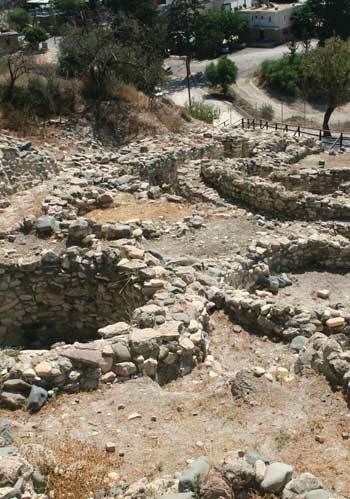 The authors identify many other planning, landscape architectural, and architectural innovations that sprouted up and spread — like the urban grid itself. And they explain how not all tactical urbanist projects are illegal, carried out in the middle of the night (although many still are). Tactics run along a spectrum ranging from unsanctioned to sanctioned. 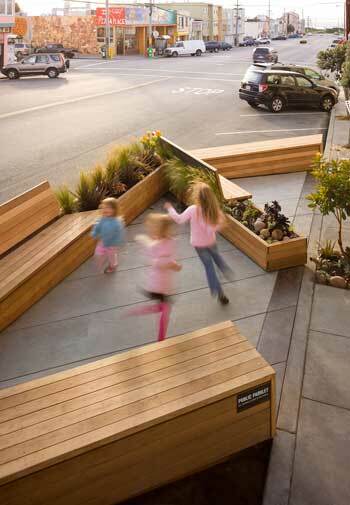 On the unsanctioned end are projects like Build a Better Block, by Streetscape Collaborative and landscape architecture firm SWA Group, which won an ASLA 2011 Professional Communications Honor Award. This first project transformed an urban street in Dallas, Texas, just for a day. “An entire block was restructured and transformed by placing new rows of street trees and a ‘median’ created of shrubs. The new open spaces created by these trees accommodated café seating and areas for vendors to sell their wares.” It gave the community a glimpse into what a more people-friendly street would do for their community. The model quickly spread to many other cities, showing many what’s possible. 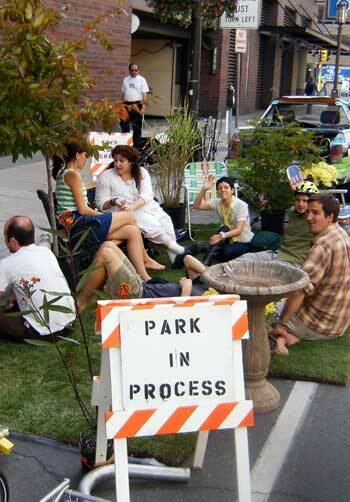 In the middle of the spectrum are initiatives like Park(ing) Day, which was founded by landscape architecture firm Rebar and conceived by landscape architect John Bela, ASLA, and has become a truly global movement. Each Park(ing) Day, residents turn parking spaces into pint-sized parks, highlighting not only how so much of our streets are given over to cars, but also all the other potential productive uses these spaces offer. This past year, more than 1,000 parking spaces were turned into mini-parks. 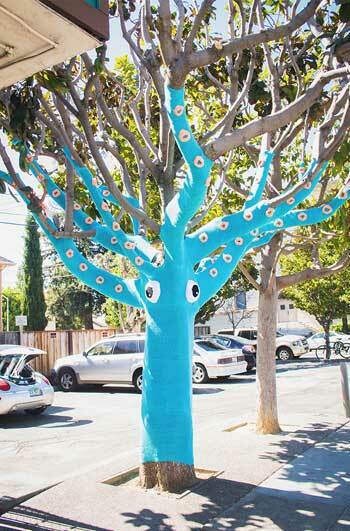 And Park(ing) Day showed one responsive city, San Francisco, that people are demanding more out of their streets, which resulted in the city government making a policy shift. On the sanctioned end: the San Francisco city government created a permanent Pavement to Parks program, which has resulted in more than 50 parklets. As John King, urban critic for The San Francisco Chronicle, points out, though, five years on, not all parklets have been successful: “They are as varied and problematic as the city itself.” Still, the parklet model has since spread to many other major cities, including Vancouver. One of the only criticisms of this thoughtful, informative book is there is no candid assessment of where tactical urbanism has gone wrong. What would have been useful is a few examples of where tactical urbanism projects have failed and what can be learned from their mistakes. Surely, not all projects are the result of supportive, inclusive coalitions (what about the naysayers in every community? Are they just left out?) Not all bottom-up community improvements are beloved. Not all parklets are well-used. Not everyone likes food trucks crowding out storefront businesses. Pop-up vegetable gardens that aren’t well maintained can quickly become eyesores, or, worse, attract rodents. No matter how well-intentioned, too few contemporary projects have shown signs of successfully spurring long-term permanent change, but perhaps it’s too soon to tell. While everyone who has been involved in the depths of a bruising multi-year battle can agree with this, urban planners, developers, and landscape architects need to continue to fight the big fights for those large-scale, transformational projects, too. Lawsuits and well-funded opposition are just part of the territory these days with any major project where there are winners and losers; it’s part of the democratic process. As Lydon and Garcia make very clear throughout, tactical urbanism can’t solve all problems. These projects are really about building community sustainability, empowering neighborhoods to push for pedestrian-friendly improvements. Community building can lead to new coalitions that yield real improvements in quality of life and replicable models that spread. The methodology for bottom-up empowerment and change is valid. But it’s not clear whether all efforts can be replicated everywhere. Times Square’s revamp as a pedestrian plaza, which seemed more like a top-down project, is the result of a unique set of factors, like smart, willing leadership. Will other cities follow NYC’s lead? Furthermore, can these efforts help solve our cities’ most intractable problems? Planners and landscape architects — really, everyone shaping the built environment– need to continue to push for the comprehensive plans that improve walkability on the broad scale; grand, permanent parks that yield big environmental and social returns; complex multi-use infrastructure; and mixed-use developments that can enable “live, work, play,” all of those major investments that can grow and sustain livable communities, while also experimenting at the small scale. We are in the era of lawsuits and opposition.